Dry. Fields, prairies, woods, waste places. Full sun. This is a 2′ to 5′ tall, erect, perennial forb that rises from a creeping rhizome with fibrous roots. There are three varieties of this plant. The center of distribution for this variety is the upper Great Plains. It is the only variety found in Minnesota. The stem is erect, occasionally branched, even bushy on open situations. The upper part of the stem is rough to the touch due to minute, stiff hairs. The lower stem is less rough. Leaves are opposite, both on the main stem and within the inflorescence. They are triangular egg-shaped, roughly like an equilateral triangle. They are on leaf stalks that can be 1 ⁄16″ to ⅝″ long, those of the main leaves averaging ½″. The blades can be 2⅓″ to 4¾″ long and ¾″ to 2″ wide and taper gradually to a pointed tip. The main leaves are usually 2¾″ to 4″ long and 1″ to 19 ⁄16″ wide. They are conspicuously veined. The upperside is rough to the touch due to minute, stiff hairs. The underside is less rough. The margins are coarsely toothed. The inflorescence is 1 to 15 erect flower heads on 3½″ to 10″ long, leafless stalks at the ends of the stems. 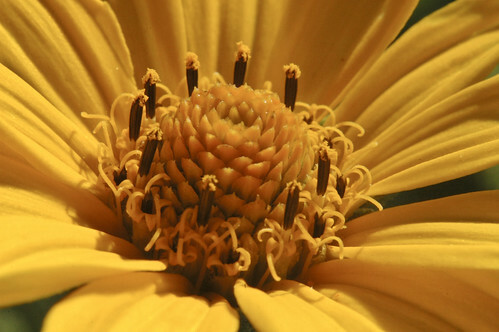 The flower head is 2″ to 3½″ wide and has 8 to 18, usually 12 to 15, yellow ray florets. The disk is cone-shaped, ⅓″ to 1″ wide, and has 10 to 75 slightly darker yellow disk florets. There is no floral scent. Unlike true sunflowers in the family Helianthus, the ray flowers are fertile. They remain attached to the head after they shrivel and become papery (see photo below).